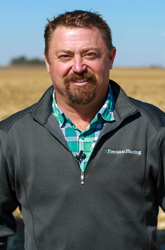 Summary: This presentation discusses the ability of planter "Sensing Technology" that can read and report important information while planting using SmartFirmer. SmartFirmer is a seed firmer along with electronics that can read organic matter, cation exchange capacity, furrow moisture, furrow residue, and soil temperature. These attributes are all important aspects of planting and can now be read and reported into the planter tractor cab so operators can understand the environmental conditions during the most important pass of a farming operation. This presentation will show the importance of each attribute measured and the agronomic consequences from a yield perspective.